Please contact us at lhs@larkspurhistoricalsociety.com for information on attending society meetings and events. In an unprecedented move, the Douglas County Board of County Commissioners passed a resolution, that recognized Penny Burdick for her dedication, deep commitment toward preservation-related issues and steadfast service on the Douglas County Historic Preservation Board from January 1993 through December 2008. Penny was a founding member of Douglas County’s Historic Preservation Board. The Commissioners spoke highly of Penny and passed a resolution of recognition of Penny, not only for work on the Historic Preservation Board but her instrumental efforts on the land-marking of the Frink House (Larkspur), Spring Valley School District No. 3 (Spring Valley), Lowell’s OV Ranch (Castle Rock) and the Greenland Townsite District (Greenland). Penny Burdick is a truly remarkable individual with tremendous drive for preserving history. Her contributions towards identifying, communicating, and preserving the history of Douglas County, Colorado are truly stellar. Congratulations, Penny! At the October 11, 2011, Board of County Commissioners Meeting, the Greenland Townsite District was approved by the Commissioners as the latest County historic landmarking Penny Burdick did the nomination with the help of Annette Gray, Archivist Douglas County History Research Center, who wrote and formatted the submitted information. Judy Hammer, of Douglas County Administrator of the Douglas County Historic Preservation Board, shepherded the landmarking proposal through the Historic Preservation Board for their approval and made the final presentation to the Board of County Commissioners. The Commissioners unanimously approved the landmarking of the Greenland Townsite District. The Commissioners commented on the excellence of the proposal and Penny Burdick thanked the Commissioners for their approval and commented that this was truly an excellent and great move that they made. 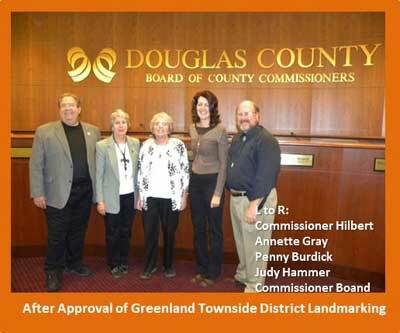 The Greenland District meant so much to Douglas County’s early history and will now be conserved for perpetuity. Penny commented that the landmarking of Greenland will save history, You know who you are if you know where you came from. Larkspur Historical Society (LHS) always spends a day annually dedicated to teaching Larkspur Elementary second graders about local history. For the last few years, LHS has provided tours and on-site educational history sessions for students at historical venues within the Society’s area. Wednesday, November 9, was different. 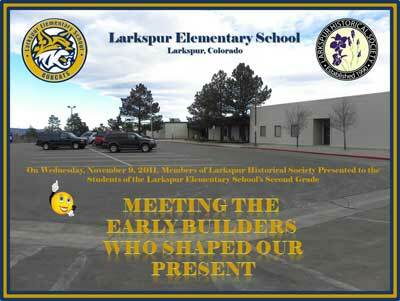 LHS members, with a classroom program called Meeting the Early Builders who shaped our Present, treated larkspur Elementary second graders and their teachers. Huntsville and Larkspur came-alive for the children with pioneers and past celebrities in period dress, telling their stories of how they and actions of their time created and forever influenced the Larkspur community. Miss Eleanor Watson (portrayed by Julie Gallick) was the “School Marm” who went against her family’s wishes, came west and became a teacher, teaching the three Rs (reading, writing and arithmetic) and advancing the cause of discipline in the classroom. Grandma Noe (Ida May Noe played herself) went through her traveling suitcase with all of its objects, doing a history lesson in an object-association scenario with the children. Sarah Coberly (Penny Burdick) and Daniel C. Oakes (Larry Schlupp) relived the birth, life and demise of Huntsville leading to the creation of Larkspur. Colorful James Abbe (Jim Weglarz) spoke about his celebrity, world fame and living in Perry Park along with the story of his three children, Patience, Richard and John, writing the book, Around the World in Eleven Days. After the history presentations, the children were each provided a book by LHS and the children’s teachers received a brochure highlighting the portrayed characters from history for each of the children’s parents. Congratulations, Larkspur Historical Society, for an educational history portrayal very well done. The Colorado-Cherokee Trail Chapter of the Oregon-California Trails Association met at Yogi Bear’s Jellystone Campground north of Larkspur on October 29, 2012. Ian and Sally Steyn hosted the luncheon meeting at their beautiful home. Vonnie Parker, Littleton author of DC Oakes, Family, Friend & Foe was also in attendance and offered signed copies of her book. Ian and Sally provided a great period lunch with chef Angila Preston, starting with Rocky Mountain Oysters and followed by entr’e items of buffalo sliders, Powderhorn potatoes, roasted turkey with plum sauce and a gorgeous apple crisp. 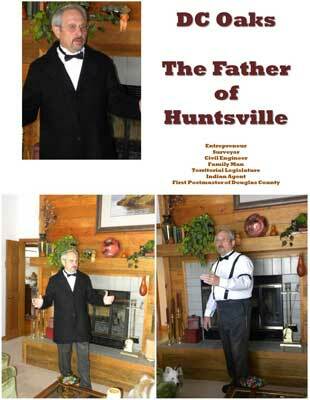 Larry Schlupp (Larkspur Historical Society) provided a characterization of the rise and fall of Huntsville through the eyes of D. C. Oakes. After the characterization, the group toured the area on the campground where Fort Lincoln and the sawmill stood. Please check-out the the Colorado-Cherokee Chapter of the Oregon-California Trails Association’s website on Oregon-California Trails Association (Colorado-Cherokee Trail Chapter). 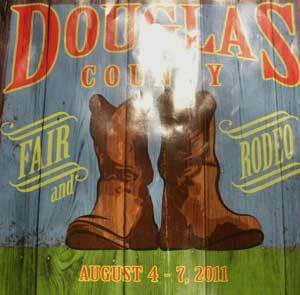 On August 23, 2011, the Douglas County Board of County Commissioners were provided an overview presentation of A Douglas County Historic Preservation Board (DCHPB) historical context and survey project initiated in 2009. In 2009, DCHPB received a grant from the Colorado State Historical Fund to historically and architecturally review thirty sites in Douglas County to determine the provenance and meaningful history value of the sites to the development and growth of Douglas County. URS Corporation was chosen by the County to perform the study. URS reviewed thirty properties that had been identified by historical organizations in the county; the review was done from the perspective of five context areas: Transportation, Industry (Wood production, quarrying and mining), Settlement, Agriculture and Recreation. Of the thirty properties, twelve were selected by URS for intensive review; URS also was directed to insert some geographic diversity to their survey so that areas were selected from around the County as opposed to being confined to one specific area. The intensive survey results and URS recommendation for eligibility for the National Register of Historic Places (NRHP) is shown below. Update on dig site and running log on progress, click Here. Privy site map, click here. This tour conducted by LHS member, Bill Noe, was held Friday, August 12, 2011. There were three vehicles in the caravan that headed north out of Perry Park. Bill had sent out materials for perusal prior to Friday. I had once read an article in one of the Denver, CO newspapers about “Millionaire’s Row”. This article was from the early 1970’s and was a feature on Lee Stubblefield’s purchase of the Perry Park Ranch. As I remember this story, I thought he was referring to his development as millionaire’s row because it would be the ultimate community. Now I am wondering since Bill told us that the area south of Sedalia to the Perry Park Ranch along 105 was referred to by this moniker. It was because the land was owned by very wealthy people – the Phipps, Young, and Sinclair families. We drove west up Dakan Road to the Dakan town site. In 1897, it was thought to be a good gold mining prospect. The town was platted by Douglas County but never had many inhabitants or permanent structures. The sons of Sarah and James Coberly had a half way house in the vicinity. It was referred to as Mrs. Coberly’s half way house. We saw the Jackson Creek Ranch, homesteaded in 1873 by Newton S. Grout, great grandfather of Beverly Higginson Noe, Bill’s life partner and Society member. We also saw the Stewart West View/ Kouba/Allis, Cantril/Beggs/Vorenburg/Plum Creek Hollow, and James Ranches. These ranches were placed by these pioneers in most scenic spots. Stops at the Glen Grove and Lone Tree schools. Both one room schools are on private property. We were able to stroll around the grounds at Bear Canon cemetery and St. Phillips Church near Sedalia. Construction of this beautiful church was begun by Newton S. Grout in 1872. Thank you, Bill, for one fine day. The historic groups were located in the Events Center against the east wall. Representing the historic groups – Historic Douglas County, the Douglas County Historic Preservation Board, the Douglas County Repository, Daughters of the American Revolution, the Larkspur Historical Society, Castle Rock Historical Society, Sedalia Historical Society, and the Parker Area Historical Society. The second photo is of our beloved LHS president, Danna Hamling, at the fair table with the newly available sized poster, note cards and area information. The last photo of the fair grounds map shows the Events Center in the middle right. That is where our fun took place. We hope to see you at the fair next year. What a day for the Larkspur Historical Society! We received a certificate of appreciation for our appearance, signed by Sherilyn West, Larkspur Mayor. Ann Aviles and Linda Nelson received the top prize for their cherry pie. They were presented with a $10.00 gift certificate and a patriotic medal on a red, white, and blue ribbon. Ann has the choice of wearing the medal with her diamond necklace to the meetings or sharing it with Linda. Either way, it will be an appropriate piece of apparel for a meeting. Penny received first prize for her peach pie; a gift certificate and a ribbon. That is not the only contest Penny won. Penny was the lucky winner of the Dresden Plate hand made quilt. Her winning ticket was drawn by Rebecca O’Horo, Miss Teen Larkspur-World. Penny started whooping and jumping around. The fellow at the microphone suggested that there was an ambulance present but they didn’t want to use it! Congratulations to Penny. The poster was on display and as always, generates interest and gives us an opportunity to share some history. Penny had her Crull/Hammond site book present. Ida May was crocheting, Susan was spinning wool, and John was displaying his firearms. El Presidente was ferrying food for the hungry volunteers. As part of our participation in National Historic Preservation Month in May, a display celebrating the life of Larkspur’s own John L. Hammond was organized. Sheriff Hammond served Douglas County from 1946-1970. 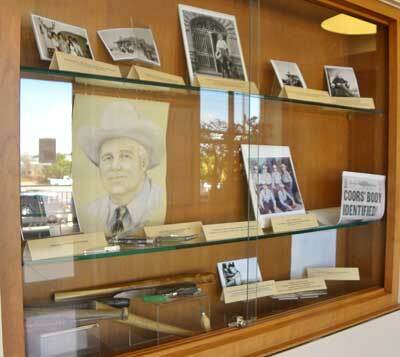 The display case in in the interior of the building, near the Commissioners Room. This display is brought to you by Society members, Bonnie Bell (daughter of John and Minnie Hammond), Danna Hamling and Annette Gray from the Philip S. Miller Library. Judy Hammer from Douglas County Community Development represents the Douglas County Historic Preservation Board. This display will remain up at least through the month of May. There are photographs, newspaper clippings, weapons, etc. Please plan to drop in and check it out. On April 12th, about 25 members of the Walkie Talkie hiking group joined Danna and toured areas around Larkspur, including the Federation, the Railroad Trestle south of town and the remnants of the Frink Creamery among other places of interest. They started at the Larkspur Park and had a good walk and talk around town. Thanks to all for participating and helping to make this event a success. The search for Fort Lincoln on April 2 had excellent participation. Joining the search were reporters from Westword and News Press coverage, the Larkspur Mayor and her husband, twelve metal detectorists from Pikes Peak Adventure League, a professional surveyor with sending GPS equipment, the U S Forest Service, Leo Hayward, and nine people from the campground business. At the end of the day, a number of items were recovered and smaller items such as nails, barbed wire and such were uncovered and flagged. We collected the material that was of significance and researchable. The flags were in place and Yogi Bear Campground will secure the site for further work. We found some bullets, a musket ball, a lot of wire, both straight and barbed, a large hinge, locket, harness buckle, horse and mule shoes, a section of a horse drawn harrow, a tobacco seal and various remnants from old tin cans . The surveyor did a superb job as well locating the 1866 pins on the east side of I-25 along Plum Creek. We didn’t find a plethora of just fort-type stuff since Fort Lincoln was never a military installation and only occupied by the residence of the area on an off for two to three weeks. The days search started at 8:30 AM and finished about 6:30 PM. It was a great day weather-wise and everyone enjoyed themselves. For the day, 2.5 acres (97,500 square feet) were searched and all detected metal artifacts were uncovered, GPS-ed and flagged for further work. It appears from initial test detecting that the area west of the fort location identified on William Pierces 1866 survey had a lot of residential activity and will be searched more heavily. A plot of all the artifacts located during the April 2 event will be plotted in the tract area by the professional surveyor, Dennis Craig. Much thanks to Bob DeWitt and the Pikes Peak Adventure League for their professional and dedicated metal detecting work. Larkspur Tree Lighting, December 4th, 2010. 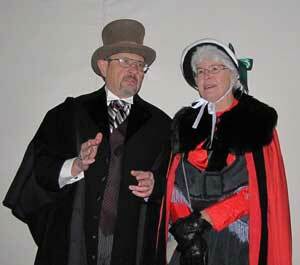 Danna Hamling and Larry Schlupp, decked out in Victorian costumes, joined the Town of Larkspur tree lighting ceremony. It was a cold fall evening when we took to the pavilion in the park to help serve refreshments to folks arriving to view the tree lighting. Over 300 cups of hot chocolate, coffee, and wassail served from 4:00PM-5:30PM. served in the former one room Greenland School, Greenland, Colorado. There were thirty five guests and members in attendance. Some Society members as well as guests had attended the Greenland School. This school served the Greenland area from 1892 through 1957. Following the closing in the mid-1950s, students were bused to Larkspur Elementary. After that, the property was used as a private residence until recent years when it was part of a large land purchase by Douglas County Open Space and remodeled for the citizens of our County. 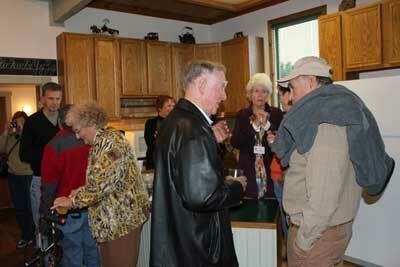 LHS members and guests enjoy the schoolhouse, the company, reminisce and share history. A educational tour showing the LHS members sites of the earliest Ranches, Roads and other items of historic interest was presented by Bill and Beverly Noe on October 11, 2010. The area covered was South of Larkspur, along the Spruce Mountain Road and the south end of the Perry Park Road. Those attending the tour were Danna Hamlin, Penny Burdick, Larry Schlupp, Ida May Noe, Beverly Noe and Bill Noe.